A bright and white smile is sure to make one’s day and goes a long way in boosting somebody’s confidence. A lot of products have been launched in the market that advertise about their teeth whitening capabilities. They can come in the form of strips or syringe based applicators. One such product is manufactured by Dr. Song and it is a professional teeth whitening syringe kit. Before understanding the product, the following is a brief look at Dr. Song. Dr. Song is a pharmaceutical and medical cosmetic company that has been researching and manufacturing products in over 30 different countries. They are headquartered in Hudson, Ohio. One can access their website here to get to know more about their products. They have also provided detailed instructions on how to go about using their products the right way to gain the most out of them. 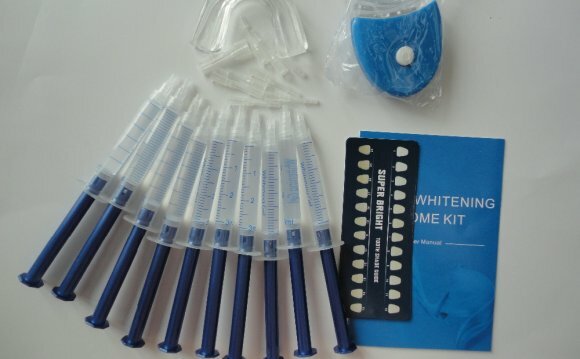 Teeth whitening kits are extremely effective when the instructions are followed to the T. All the important information of this sort is always mentioned on the packaging. Therefore, it is essential to know everything there is to know about a product before using it. After all, it is always smart to know about the complete specifications of the product to prevent any accidents due to allergies or ill-informed choices. The package consists of 8 syringes which are large in size to last up to 50 applications. There is a gel applicator brush that makes it easy to apply gel. LED Blue Light Accelerator – this speeds up the whitening process. Carbamide Peroxide is the key bleaching ingredient that causes the whitening and it is available in 44% concentration. Some of the other gel ingredients are: water, glycerin, carbomer, potassium sorbate, disodium EDTA, flavor. It is very important to follow the mentioned instructions for gaining the most out of the product. Recognizing this fact, they have provided comprehensive instructions on how to use their product here. The tray are moldable and hence, one needs to get the fit perfect before dipping the trays in boiling water to get the desired shape. In case, the shape is not correct, the process can be repeated. The whitening process should not be rushed and hence, it is advisable to brush and floss one’s teeth before the going ahead. Dispense a small amount of gel on a surface and apply it to the teeth with the applicator brush. Be sure to avoid touching the gums. The tray should then be placed on the teeth and any excess gel can be wiped off. The gel can be kept on for as long as required (30 minutes to 4 hours) depending upon the intensity of treatment required. If one has LED tray lights they can place it on the tray for 15 minutes and use it before each session. There are some finer points to address while using this product, which are listed as follows. Any contact between the gel and gums should be avoided as this could cause irritation. The teeth should be brushed before using the gel as it is more effective on a cleaner set of teeth. Only a small amount of gel should be used. In case, there is excess application the tray might cause it to spill. To avoid this wastage and gum irritation, it is advisable to take a judicious amount to begin with. The trays should be cleaned with warm water and tooth brush after every use. These are the key selling points of this product that cannot be found in any other product. They provide a special demineralization gel to be used after every whitening treatment. This gel is supposed to get rid to any gum irritability or teeth sensitivity issues. The main components of this gel are: Water, Alcohol, Polysorbate 20, Carbomer, Potassium Sorbate, Potassium Nitrate, Mentha Piperita Oil, Dicalcium Phosphate Dihydrate, Dicalcium Phosphate, Flouride. The trays that they provide are moldable so they can be reused to fit the contours of one’s mouth perfectly to yield the best results. There are many takers of professional quality home teeth whitening solutions and here is what the customers of Dr. Song have to say about this particular product. The effects may take up to 4-7 applications to show any noticeable effects but these effects are long lasting. So patience and proper application is the key to utilizing this product to its fullest potential. The kit provides a brush that is very convenient for applying the gel. One can exactly figure out the amount that they want to use and apply it accordingly. The consumers seem to be very happy with the immediate results that they got to see. They claim to see some improvement almost as soon as they started using the product. One other plus point was the generous amount of product that is being made available at a very affordable price. The common complain about other products is usually their small quantities. But here is a product that lasts up to 50 applications.